ASQ's QP Salary Survey shows quality professionals' salaries dipped in the United States but increased in Canada. But while U.S. quality professionals are making less on average than in 2011, there are variables they can control to boost pay -- like pursuing further education or certifications. Quality professionals' salaries in the U.S. in 2012 dipped slightly, whereas their Canadian counterparts saw an increase. Even though salary increases slowed this year, there are factors quality professionals can control to earn a higher salary, like earning certifications or pursuing further education. The average salaries for quality professionals remained steady in 2012, showing no significant change compared to 2011, perhaps in light of lingering effects of the recession, according to ASQ's Quality Progress magazine’s 26th annual Salary Survey. This is the first year since the recession began in December 2007 — and ended in June 2009 — that quality professionals’ salaries didn’t increase in the United States. From 2008 to 2011, salaries increased an average of 2.24 percent each year. Furthermore, it’s the first time since Quality Progress magazine began the annual survey 26 years ago that salaries remained flat from the previous year. In general, salaries in the United States increased an average of 2.72 percent from 2011 to 2012, according to Aon Hewitt, a global leader in human resources solutions. From 2008 to 2011, salaries in general increased an average of 2.67 percent. The survey results are featured in the December issue of Quality Progress magazine — the flagship publication of ASQ— the leading authority on quality in all fields, organizations and industries. More than 6,000 quality professionals from all industries and market sectors completed the annual survey, a response rate of 11.2 percent. In addition to the QP Salary Survey, Quality Progress magazine has updated its salary calculator reflecting 2012 data. The calculator, which is available to ASQ members, allows users to pinpoint salaries based on variables they choose. Like salaries, the number of unemployed quality professionals also remained steady in 2012, according to the survey results. In 2012, 2.5 percent of respondents said they were unemployed, retired or laid off. In 2011, 2.7 percent claimed the same employment status, according to the survey results. According to the 2012 data, and substantiated by years of similar trends, the more ASQ certifications obtained, the higher the average annual salary. There is a clear disparity between those who have obtained no certifications and those who have. More than 56 percent of respondents in this year’s survey have earned an ASQ certification, with 22.55 percent earning two or more. Respondents with no certifications earn an average of $84,760 annually, whereas respondents with six or more certifications earn an average of nearly $103,000, the results show. Respondents with one certification earn $85,268, and those with two earn an average of $92,569, according to the survey. — Auditors with a Six Sigma Black Belt Certification earn an average of $24,708 more than their uncertified counterparts. — Calibration technicians who obtain ASQ’s Calibration Technician Certification make nearly $16,000 more than non-certified technicians. — Quality engineers with a Manager of Quality/Organizational Excellence Certification earn an average of $11,661 more than quality engineers without any certifications. Like the number of certifications, the number of years in the field plays a role in salaries. As expected, the more years worked, the higher the salary, according to the survey. In the United States, quality professionals with more than 20 years’ experience in the quality field average nearly $100,000 annually, according to the survey. Conversely, quality professionals with less than a year of experience earn an average of $63,674. The gap is wider in Canada. Quality professionals in Canada with more than 20 years’ experience earn an average of $101,570, whereas those with less than a year of experience earn $59,000, according to the results. For 26 years, Quality Progress has released its annual Salary Survey, an indicator of the health of the quality profession using survey results. The survey breaks down salary information, submitted by ASQ members, in 24 sections and sorts results by job title, education, years of experience, and geographic location. The QP Salary Survey is sponsored by MEIRxRS, a contract research, recruiting and staffing organization. ASQ members can view the entire QP Salary Survey results by visiting qualityprogress.com/salarysurvey. During December, a portion of the report will be available through QP’s digital edition, which can be accessed through qualityprogress.com. ASQ is a global community of people dedicated to quality who share the ideas and tools that make our world work better. With millions of individual and organizational members of the community in 150 countries, ASQ has the reputation and reach to bring together the diverse quality champions who are transforming the world’s corporations, organizations and communities to meet tomorrow’s critical challenges. ASQ is headquartered in Milwaukee, Wis., with national service centers in China, India and Mexico. Learn more about ASQ’s members, mission, technologies and training at http://www.asq.org. 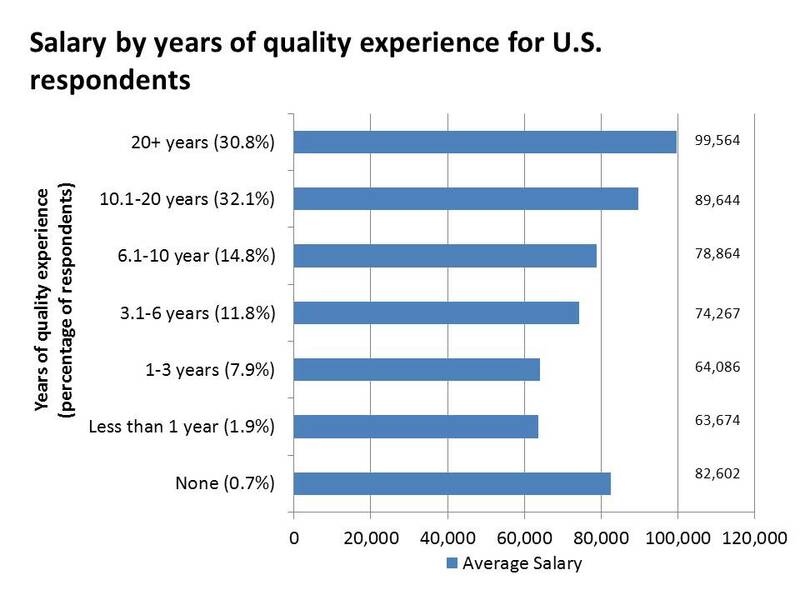 The more years of experience a quality professional has, the more they earn, according to QP's annual Salary Survey.Graph depicting salaries based on years of experience.